At interFusion, we think games should not fit some mold or be easily matched with a genre. Our first title is coming to Steam Nov 6th, 2017! interFusion's first PC-exclusive Steam release will be a 3d roguelike with procedurally generated levels....but our games are not easily defined by genre. 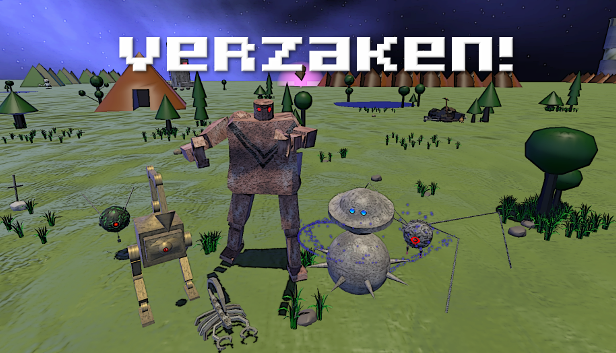 Inspired by classic 2d titles such as Legend of Zelda, Golvellius, and Golden Axe Warrior, Verzaken! aims to bring the essence of 2d retro adventuring to the 3rd dimension! Lonely wandering in an infinite yet empty world, devoid of intelligent life....Will our mysterious lone protagonist keep pressing on his adventure? Or will the isolation with no expectation of reprieve be too much for our hero to handle? Only YOU can find out, because the hero of Verzken! is not who he seems.... Who is he? Why is he here? Where is here? Will the infinite nightmare ever end? VR is the future of video games. The future of video games is VR. Join interFusion into 2018 and beyond as we explore this brave new landscape- you're gonna wanna see what we have in store for you! interFusion Games also has an upcoming product line-up for future release on Google Play and the Apple Store as well- keep your eyes peeled in 2018! Any game should be fun first and foremost! But whats wrong with giving back a little, and making the world a better place? Kids: nothing is more important than education, not even video games! ​*Ahem* with that being said.... there's ABSOLUTELY no reason an educational game can't be as fun as any other! We don't believe in such limitations at interFusion Games. We believe in not boxing ourselves in. We believe video games are an art form with an endless number of variable styles in both presentation and gameplay. At interFusion Games, we believe in combining the best of all worlds, and bringing imagination to life without restrictions or doubt. Comparing one game to another gets us nowhere...the question is, is the game enjoyable?"